Schumer starts looking up in a spoof of Boyhood where her and a young boy answer the question, "What do you think your life’s going to be like?" 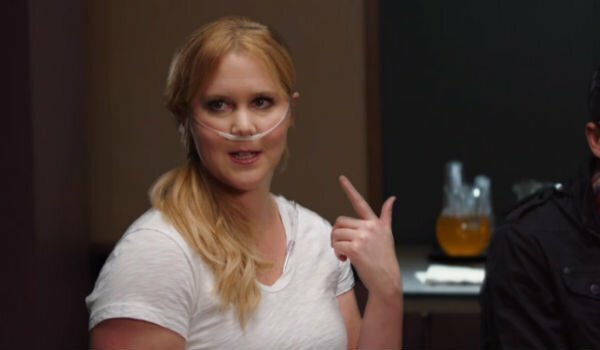 To which Amy realistically responds, "I mean statistically I’ll get HPV and get some sort of manageable eating disorder and wind up as one of those girls on The Bachelor who yells at strangers in a hot tub." And so it begins, the Amy Schumer raw humor that does not apologize. Soon after, the MTV Movie Awards host is awakened by none other than Aubrey and Chloe from Pitch Perfect and gets kicked out of the group, as they are probably gearing up for the sequel to their fan-favorite flick. And Schumer sadly comes to the realization that she won’t be a part of their sing-along and decides to find where she does fit in. That’s when Divergent comes up, helping Schumer come to the realization that she is destined to host the MTV Movie Awards. And so, Schumer goes forth on her journey to meet one of the nastiest coaches you’d ever want to meet, J.K. Simmons as his terrifying jazz conductor character from Whiplash. If there’s one thing we can learn from Schumer in this interaction is that when Simmons starts throwing things, move away, slowly. Schumer decides to hide from the Whiplash star in a support group meeting featuring Shailene Woodley’s The Fault In Our Stars character and things get a little awkward. As Schumer blatantly interrupts the group of cancer patients to talk about her dilemma (hosting the MTV Movie Awards), Shailene Woodley looks incredibly pissed. Schumer tries to lighten the mood by asking, "Is anyone else like not getting high from these things? Like is there a trick or something?" pointing to her oxygen tube. Quickly Schumer gets paired up with The Hunger Games’ Effie Trinket who sends the comedian up to the stage with a few words of wisdom, just not in the Hunger Games style Schumer hoped for. It was a quick montage, and may have felt a little rushed at times, but it was a fun way to start the awards ceremony, and gave everyone a chance to get acclimated with that quirky Amy Schumer humor that you either love or hate.